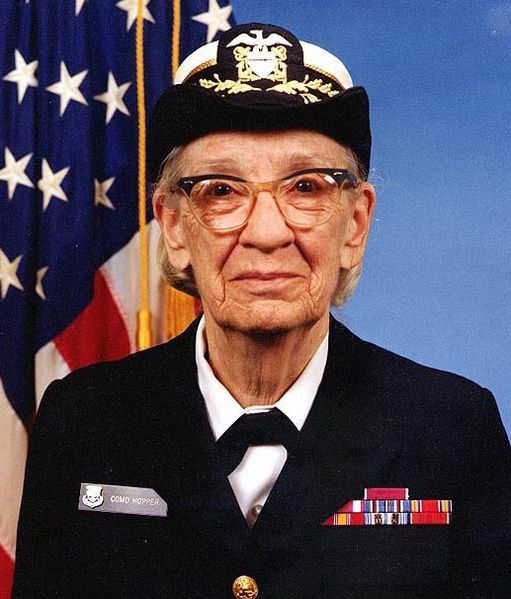 Thank you to Jill S. Tietjen, President and CEO of Technically Speaking, Inc. and regular contributor to Grandma got STEM for this remembrance of Admiral Grace Hopper. 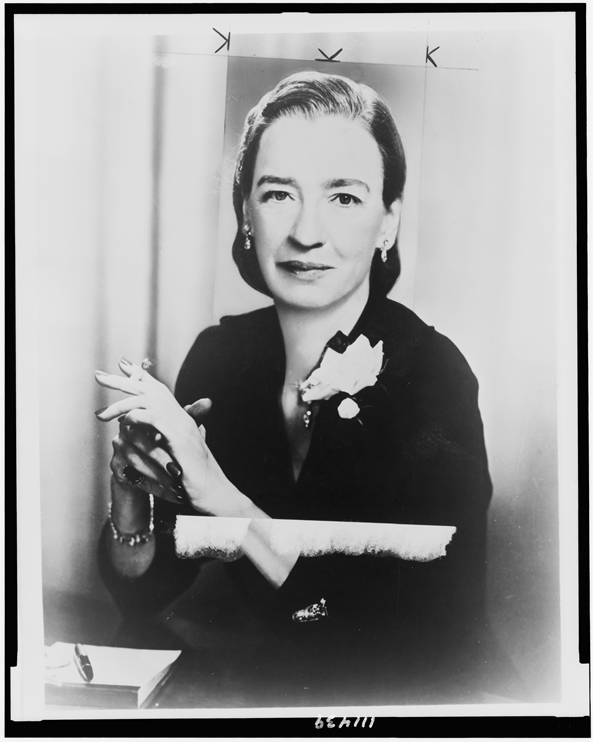 The woman whom I credit as the catalyst for all of the work that I have done in writing about historical women and who was my first successful award nominee is Admiral Grace Murray Hopper. Admiral Hopper developed the computer compiler. That is the software that allows us to speak to the computer in our languages – English, Spanish, Chinese, Swahili, Japanese, French, German, and so forth – and translates our languages into the zeroes and ones that a computer understands. She also developed the first English-based computer language – it was called Flow-Matic – and she was instrumental in the development of the business programming language COBOL. 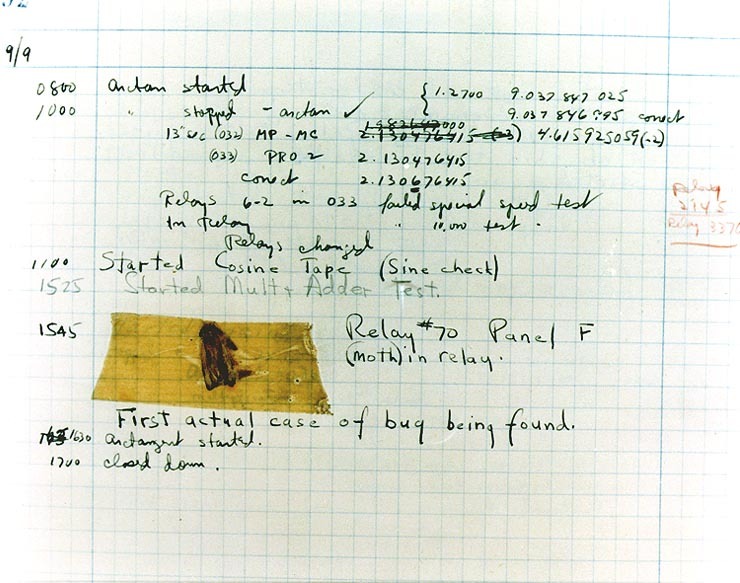 She loved to take credit for finding the first computer bug; it was a moth, stuck in the relays of the computer she was working on at Harvard. Admiral Hopper carried around pieces of wires with her – they were 11.86 inches in length – her nanoseconds. The wire demonstrates how far light travels in a billionth of a second (a nanosecond) and thus how quickly a computer operates. She was very interested in educating the public – and especially young people – about the wonders that computers were going to provide for our lives. And, wonders they have – iPads, ipods, smartphones of all kinds, laptops, embedded chips in coffeemakers, stoves, refrigerators, elevators, automobiles. Her compiler enabled all of these advances. 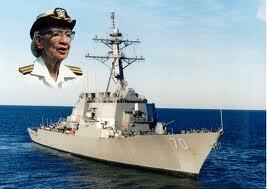 I nominated Admiral Hopper for the National Medal of Technology – which she was awarded in 1991. She asked me to receive the Medal at the White House Rose Garden from President George H.W. Bush as she was too frail to attend the ceremony. I met her sister, Mary Murray Westcote, at that ceremony. After Admiral Hopper’s death, she became my first successful nomination to the National Women’s Hall of Fame and the family asked me to receive that award (1994). In 1996, I was delighted to be able to attend the launching of the destroyer Hopper (DDG-70) with members of her extended family. Admiral Hopper had received the Society of Women Engineers’ (SWE) Achievement Award in 1964. Although I never met her, I did speak with her several times on the telephone and she did sign one of her biographies for me. One of my proudest achievements as National President of SWE was the establishment of scholarships in her memory awarded every year by SWE. Here are a YouTube video of Hopper’s appearance on David Letterman and a video of Hopper on 60 Minutes. This entry was posted in Computer Science. Bookmark the permalink. She was a wonderful woman with a great sense of humor. One of the greatest moments in my life was meeting her, and she was a real hoot! argylesock: Would you like to write the post for Augusta Ada King?